DO NOT PARK IN THE SALVATION ARMY CHUCH PARKING LOT. Parking is limited. All race times remain the same. Sorry for the inconvenience.....Mother Nature calls. Kit Pickup/New Registration will be open from 4pm-9pm on Friday and 9:30-4:00pm on Saturday. Parking for the run is available in the parking lot across from the courthouse for $5. The annual ‘Run for Retina Research’ is an event developed to raise funds for research at the Ivey Eye Institute in London Ontario. Thousands in our community and beyond suffer from genetic retina eye disorders such as Retinitis Pigmentosis, Best’s Disease, Usher Syndrome, Coat’s Disease, Age Related Macular Degeneration and Stargardt’s Disease, a juvenile form of Macular Degeneration. the loss of personal independence and activity level as a result of this cruel impairment. The visual world gradually diminishes into a vague blur, making ordinary daily activities challenging or for some, impossible. Here is the offline registration form. Download a Pledge form here. All races start and finish near the Pavilion in Harris Park. All courses are comprised of routes that use London’s scenic park system and fitness trails. 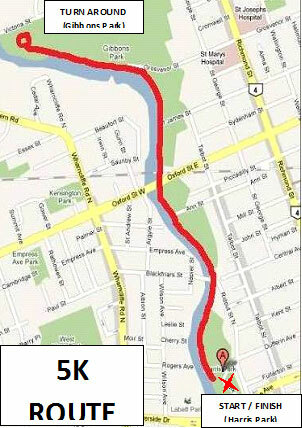 All 1/2 marathon and 5K runners will proceed North/East along the river until they reach the turnaround in Gibbons Park, returning to Harris Park on the same route (where the 5K finishes and the 1/2M continues West). 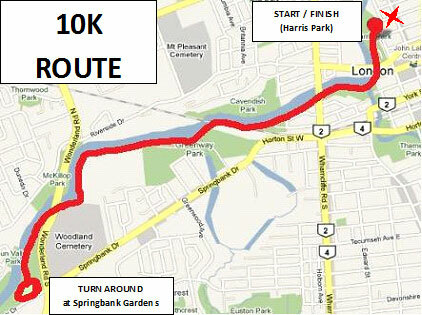 10K runners proceed West directly from Harris Park, through the River Forks Park, past the London Regional Children’s Museum, through the Greenway Park tunnel and along the Terry Fox Parkway, through Saturn Park until they hit the turnaround just past SpringBank Gardens, returning to Harris Park along the same route. 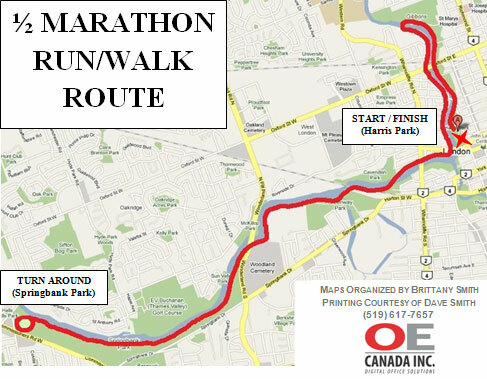 The half-marathoners will continue West making a loop through Springbank Park, then follow the same return route back East to Harris Park. 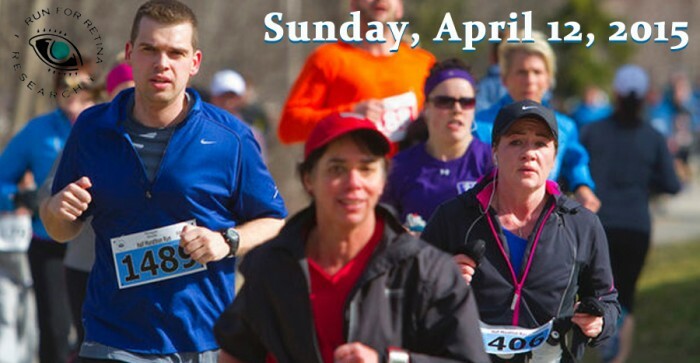 RACERS WILL RECEIVE A DELUXE RUN GARMENT (can be worn as a shirt or a jacket/pullover). *registration by March 1st guarantees a jacket, from Mar 2nd on - while supply lasts – (first come/registered – first served/filled). Men’s and Ladies samples are at Runners Choice for you to try on. Since the 1/2 M walk is not monitored no Monetary Prizes are offered. who attain the largest pledge amounts. medal engraved with their accomplishment at No Charge. For those wanting to record your achievment – Available again this year! Have your medal engraved! Nothers is a proud supporter of the Run for Retina Research and we would like to offer you the opportunity to obtain a unique momento of your achievement. You will find our tent near the finish line, where we will be able to engrave your race time onto the “Run for Retina” medal you just received. It makes a great keepsake and a lasting memory of your accomplishment.